An indispensable addition to your project management, software engineering or computer science bookshelf, this book illuminates and simplifies otherwise complex topics in ROI. It presents extremely simple, but powerful metrics, models, and methods for designing professional business cases and providing hard-hitting economic justification. It explores the most popular international methods, models, and standards for software process improvement. 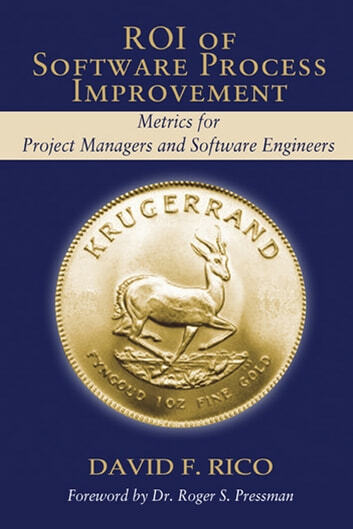 The authors practical tutorial on the costs, benefits, and ROI of software process improvement is a soup-to-nuts guide that helps readers rapidly master powerful concepts. Rico demystifies esoteric concepts in ROI and provides a self-contained tutorial of ROI methods for novices as well as economic experts and a treasure-trove of value adding economic data which is missing from popular texts. The ROI of Software Process Improvement features a number of free downloads to help continue the learning process outside the pages of the book. Passing the PMI Scheduling Professional (PMI-SP) (c) Certification Exam the First Time!